Breaking down Player · Exploring Microservices — Game On! Over time, the Player service, which was filling multiple roles, felt more and more out of place. It was already cut down once, when we moved the webapp out, but as we resolved some websocket traffic management issues in the mediator, it became clear that we had two very different work patterns within the same service, one dealing only with CRUD operations, and one wielding data flowing over long-running connections. The two workloads have fundamentally different behaviors and scaling characteristics, and should not be housed in the same service. The (new) Player service (even if we keep the auth and player datastore together) is REST-only, with short-lived operations with well understood load/scaling characteristics. 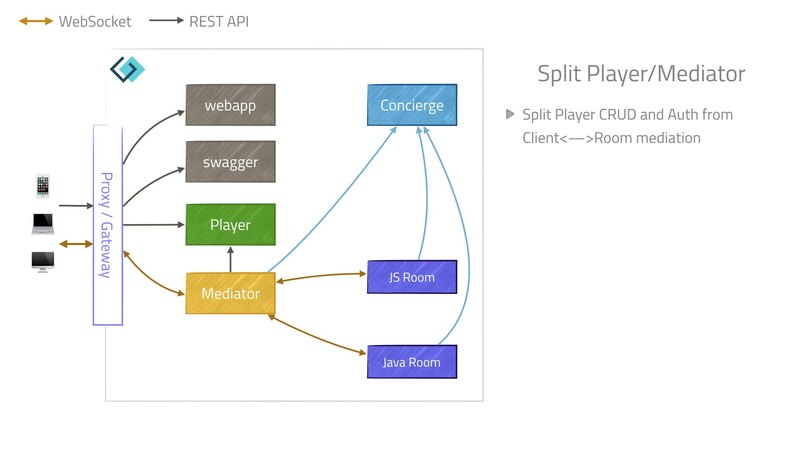 The Mediator service, which performs the task of mediating between long-running WebSocket connections. The connection between the browser and the mediator is active as long as the player is connected. The mediator then manages creating and destroying connections to rooms (other services) as players move around. Scaling characteristics here are harder to determine, as there are usually two long-running WebSocket connections established for each active player.